Often used in racking and similar structures, the fitting allows both uprights and front and rear horizontal rails to be continuous. 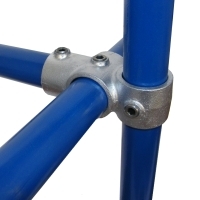 It is usually preferable for the upright to be on the outside of the structure (as illustrated in picture) for maximum stability. Through tubes cannot be joined within the fitting.